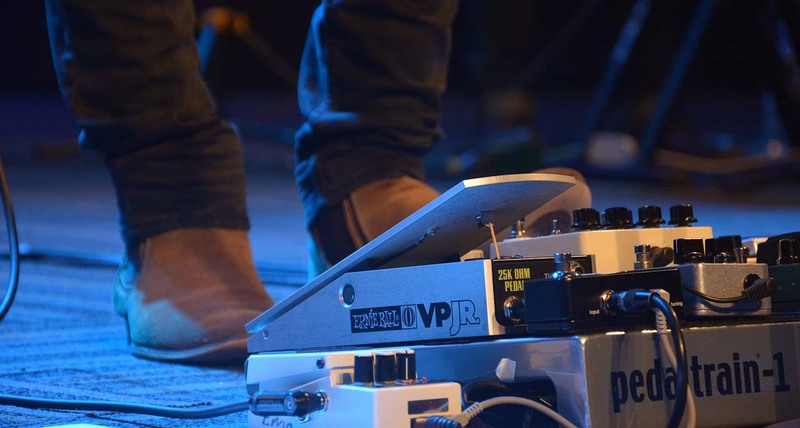 Whether you've been in the guitar game for a while or are just starting out, you are probably familiar with the freedom that compressor pedals offer for customizing your sound. They're great for creating unique new tones and essential for nailing some of the classic sounds you hear in iconic rock albums. Adding compression enhances your tone, levels your sound and gives the music a richness that will make you really stand out from the rest of your band. These pedals make a massive impact no matter your style and have been used by some of the most famous guitarists in history. If you aren't using a compressor, you could really benefit by getting one now. Different pedals offer different unique features and modes that allow you to adjust the levels and effects to meet your specific needs. Depending on how much control and customization you want to have, some compressor pedals might be better suited for achieving the sound you want. This easy-to-use, multiband compressor features three powerful modes that provide a natural compression sound across various styles. 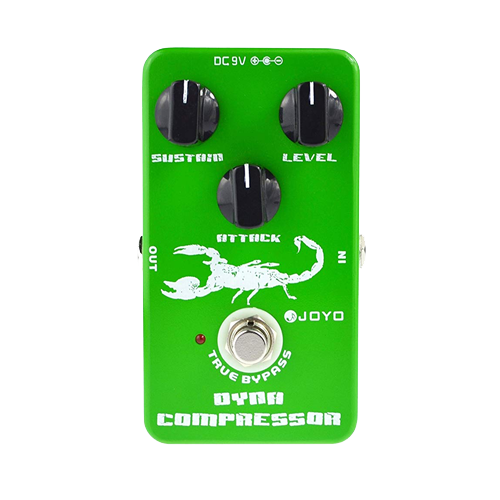 The classic Ross compressor is reborn with this powerful compressor, Joyo, made with bassists in mind. Enjoy the versatility of full squash to smooth, open parallel compression, while keeping your tone perfectly intact. This compact, simply designed compressor offers superb sound and tone quality and a wide range of compression tones. Achieve endless sustainability and ultra-smooth compression with this pedal by Behringer. Make your tone sound better than ever with the TC Electronic Hyper Gravity Compressor. Like most of TC’s pedals, this compressor is quite simple to use and also features a built-in limiter for adding in effect-type, squashed compression tones. This pedal is full of power with three compression modes to choose from. The first mode is inspired by the same MD3 algorithm used for compression in TC’s System 6000, which allows for more natural sounding compression. The second is a more vintage-inspired compressor for achieving those classic stompbox tones. And lastly, Tone Print allows for endless custom compression combinations. If you’re a fan of the classic Ross compressor, this one’s for you. This is a re-creation of the Ross but with a lot less noise. You have complete control of the tone you want with Attack, Sustain, and Level knobs. The Attack knob is especially useful for bass players in leveling higher output pickups and boosting your bottom end. 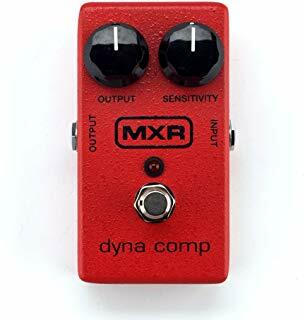 This dynamic pedal allows for so much versatility in sound.Whether you're looking for something sweet and smoothor a little fuzzier, your tones will are still guaranteed to be rich and articulate. It's incredibly sturdy and durable, with a stoving varnish finish on its aluminum alloy outer shell. Some compressor pedals require a bit of sacrifice when it comes to your tone. However, this compressor by Wampler lets you take advantage of all the benefits of a compressor while retaining dynamics and without adding extra color to your tone. By tweaking the comprehensive set of controls - including Sustain, Tone, Blend, and Attack - Ego allows you to have complete control over the squash and squeeze so you can customize the effect and get your ideal tone. One of the best features is the option to use it as an effect or keep it on at all times. This helps out during solos so that your rhythms aren’t too flat. It works great with any amp you choose to use it with. You’ll be able to sustain your sound forever, without altering the tone of the amp. Here’s another pedal inspired by the highly regarded Ross Compressor. Its simple design makes it very easy to use. Whether you’re wanting to achieve a modern, subtle, or even vintagesound, this pedal is a great addition to your pedal collection. It sounds great with distortion, reverb and more, andits compact size keeps it out of the way. You’ll enjoy its flexibility and versatility. 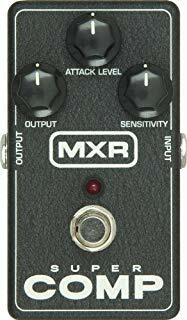 It features up to +15dB of boost, a dry blend knob, and an internal dip switch for controlling attack. The Behringer Compressor has turned many musicians into fans. You’ll be able to achieve a smooth, velvety sound at a consistent volume. Using the Sustain and Attack controls, you'll be able to set your compression to exactly the right level. Whether your style is clean, super fuzzy, or something in between, the CS400 will help smoothly boost the lower signals while compressing the loud ones. All this without sacrificing the integrity of the tone. This pedal also features a blue LED display for battery life and effect on/off status, so you can easily glance down and check it out. In addition, it's made from the highest quality components and rugged, durable construction.It will last you a very long time. When it comes to buying a compressor pedal, it’s important to understand a bit more about what they actually do and how they do it. This can help you decide which one you ultimately want to buy. It will also help you in being able to listen to one in action recognize if it’s doing what it needs to be. Although it can be used as an effect at times, compression is more often used as a tool by guitarists and bassists. Compared to the more notable effects pedals such as delay or distortion, compressors might seem quite subtle. But once you've played with one, you won't want to play without it again. Compressors make your sound smoother and more fluid while bringing clarity to your notes and chords. Since some strings on guitars and basses tend to sound a bit louder than others, adding compression helps to balance out the differences in volume automatically. You'll set a predetermined level that boosts the quieter signals and lowers the louder ones. Being able to better control dynamics results in a more balanced, level sound, as well as longer-sustaining power. There are many factors to consider when determining what makes a good compressor. You need to make sure the compressor pedal you choose is going to work well with your setup and perform well in what you want it to do. Anti-skid pads: to keep the pedal firmly in place so you can easily adjust the controls without it moving around. LED lights: so you can easily see when it's on or off without having to stop playing. Some pedals with LED displays even have a battery life indicator, as some compressor pedals are only able to be powered by a battery and can die at very inconvenient times. Rubber covers for the knobs: to easily set and move the knob controls with your hands or toes. Take note of what volume levels your compressor pedal offers. You can use the volume control as somewhat of a boost or you can use it to put a cap to its gain so that you don’t get distortion in the signal. When shopping around, you’ll likely come across the terms “buffered output” or “true bypass”. Simply put: a pedal with true bypass won’t impact the signal once it’s turned off, whereas a buffered output will actually boost it. A lot of musicians agree that not using a true bypass can actually weaken signals and make the sound lack clarity. So true bypass tends to be a feature that you’ll want to look for when shopping for your compressor. Pedals can be pretty bulky. Once you start adding more and more effects pedals, things can get a bit crowded on your pedal board. If that’s the case for you, or you plan on acquiring more pedals down the line, be sure to consider space while shopping. Find something a little more compact. The only things that you really sacrifice with the smaller models are knobs, which can limit their versatility of sound. But in actual fact, a lot of the smaller pedals work and sound just as good as the larger ones. Invest in a compressor with good durability. A metal shell with a good finish is most ideal because it won’t begin wearing for a long time. Aluminum-alloy is typically the most durable and can last for years without beginning to look worn. Just the outside appearance and construction will show you a lot about how well it’s made, how sturdy it is, how well the knobs more and are installed, etc. Optical Compressor– These types of compressors tend to be the most natural-sounding. They have slower release times and give off smooth tones. Multiband Compressor – These break the signal frequencies in the different bands and compress each one individually. This will give you the most precise dynamics. OTA (Operational Transconductance Amplifier)– OTA’s are the most common type these days. They depend on a circuit chip that once was criticized for adding color to the tone, but modern models have fixed that issue, making them especially effective for use with guitars. Some compressors are battery powered - a select few need to be connected to an external power source. It’s becoming more common for pedals to have the option for either. Regardless, it should be clearly displayed on the packaging. Adding a compressor pedal to your setup can help enhance your playing by smoothing out your sound while preserving the integrity of your tone. You can use it as a powerful effect to really customize your sound, or as subtle balancing tool to control the volume of different signals. There are some seriously great pedals on this list. To decide which one would be the best fit for you, consider what type of sound you want to achieve, how it could complement the pedals and effects you already own. Of course, consider your budget. Shopping for a compressor can be overwhelming, especially if you aren’t well-versed in pedal jargon. With the right information and patience, you’re sure to find the perfect one to meet your needs. Once you've found one that suits your sound and experienced the benefits of a compressor pedal, you'll never look back.